In the past four month, there were thousands of pieces of fan art, hundreds of hours of streamers and much content update for Blade & Soul. In my opinion, the newest update for BNS tries to give up PvP, and PvE separated is too insane. It is made even more absurd when players take into account the fact that they have conceded to the requests of PvPers, to allow them to get what were PvE rewards, through PvP, because they didn't want to do the PvE required to get them. By forcing everyone, to do both, you'll please very few people. Make a poll (one vote per account) to ask the remaining people what they think, rather than just pretending you know what we think. Just buying mats doesn't really work, as considering the absurd number of them we need, their price has been going up since various content updates, and the last event. You say this is as the higher level content rewards more gold, while this is partially true, the other part is that with all the new content being added at an absurd rate, it doesn't allow time for excess mats to build up before even those at the top, need more. Another problem is when you still need a mess of those mats for lower level upgrades, crafting, and so on, you're stuck behind a progression wall, meaning you can't really get at the higher level, more rewarding content this is partially responsible for the higher price, to allow you to afford buying mats, and paying fees more effectively. The end result being that many players just end up falling even further behind, and new players are in a bind as you pump out new content, which will require even more of those mats, from the same old sources, add more ways to get a lot of gold, and in turn further increase the cost of mats. While in time it will work itself out, the game will by that time will have hemorrhaged a considerable number of people that got fed up with things as they are, and will remain for some time yet, as you're showing no signs of slowing the update flood. This all also means making alts doesn't work too well. With many other games, getting your leveling chars geared up isn't too hard, especially if you have a high level main, as they can farm stuff, and send it along to the alts. Far too many items here though are character bound on pickup, rather than account bound, a change that would make playing alts far more manageable, which is why it was asked, but you guys just said no, as it's supposedly too hard. Many of us doubt that it's all that hard, especially given how you've managed to make various costumes that were character bound, account bound instead already. With other games, the real grind in all respects is at the end game, mainly for those that want to focus on one character, here the heavy grind sets in early, crushing the will of people to play, and removing any real desire to make alts if they expect to get out of Moonwater with them. We've seen many other games put in big changes, mainly aimed at making the leveling process easier/faster, plus to be made more solo, and alt friendly. These can be things like solo versions of dungeons, more items made account bound, rather than character bound, new easy to acquire, and rather nice equipment, plus stat, XP gain and/or other benefits for alts when you have high level characters. These occur not just as the game is getting older, and may be losing a lot of the population it once had, but as it adds more high level content, adjustments need to be made to make the game on a whole more approachable for new players, and alts, as that smaller population has been spread out over an ever widening amount of game content. By releasing content as fast as you have, supposedly for the sake of Esports, which I have no doubt most of the remaining players you have don't care about at all, you're just exasperating every problem, and these pay to participate events you hold don't fix these problems, they just alienate the game from your potential players. 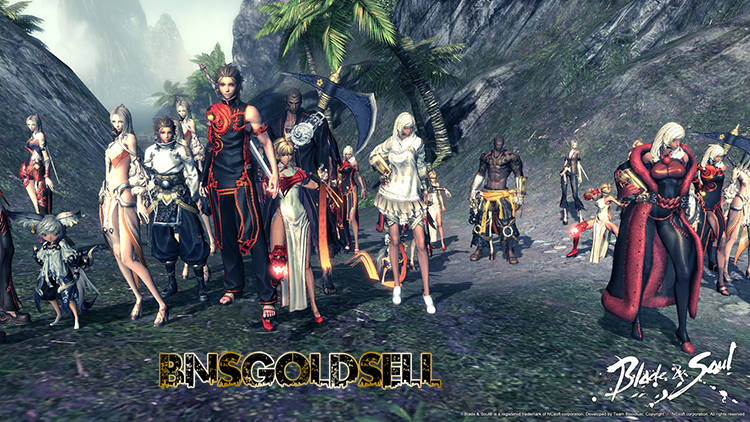 If you want to buy Blade and Soul gold, BNSGoldSell provides cheapest Blade and Soul gold with 24/7 professional live service and safe & fast delivery!